Unibet should optimize their screen real estate! I’ve played poker at Unibet for a while and I get frustrated every time I start the instant poker client. 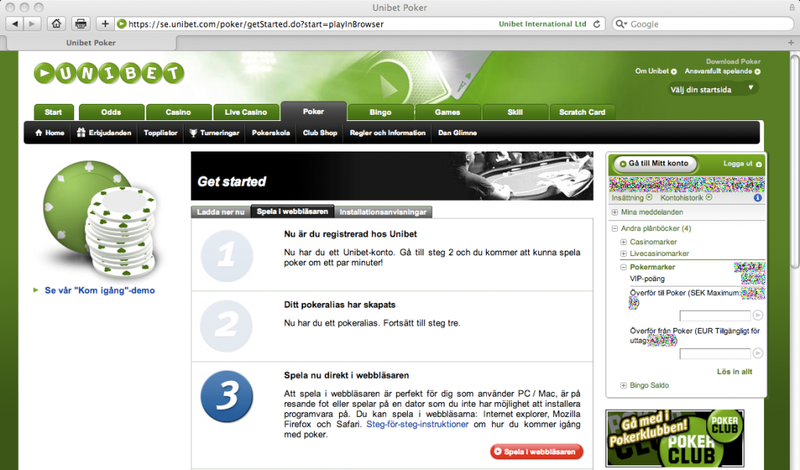 Unibet has made a page where there are 3 steps you have to do before you can play. I did all 3 steps the first time and every time after that I only need to start the poker client. But what is a bit confusing is that Unibet still shows the same page with the 3 steps everytime I want to start the instant poker client. Why not make better use of the screen real estate? Unibet should use the screen real estate for things interesting for me as a regular player and not think of me as a beginner. Since they know I’ve completed steps 1 and 2 Unibet also knows that my main player goal is to start the instant poker client. I would actually skip the page all together and just start the poker client when the player click on the “Play without download” button on the previous page.